Following up on an earlier post, where I announced my seeking out the webcomics for “Star Wars: The Clone Wars”, I ordered and received “Star Wars Tales from The Clone Wars – Webcomic Collection Season 1” from Dreams and Visions Press (here is their webpage for ordering the book) and I am really glad that I bought it. In order to read the pre-episode webcomics, no longer do I have to connect up with the Internet to try to read the Webcomic on the Wayback Machine, which is not even all that clear sometimes (it’s a bit blurry, quite often). Now, one can easily flip to the right pages in this volume. Also, the quality of the paper and the printing are great! Additionally, it also includes (as does the season one webcomic) the post-season one content, consisting of the “Hunting the Hunters” series (entitled “Gunship Over Florrum”, “Hunting the Hunters Part I”, and “Hunting the Hunters Part II”). It furthermore includes some sketches and other artwork, but the webcomics are the primary focus. With so much new territory being explored, it became clear that even with twenty-two episodes in a season, there were many more Clone Wars stories waiting to be told. 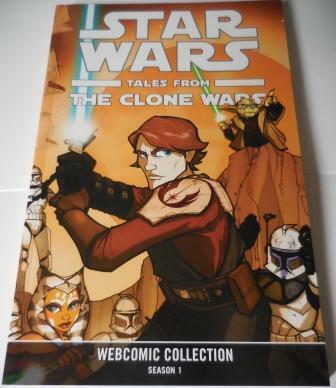 Novels, storybooks, and comic books began chronicling original Clone Wars adventures. StarWars.com undertook the challenge of telling weekly, bite-size chapters, written by Pablo Hidalgo and illustrated by Tom Hodges, Katie Cook, Grant Gould, and Jeff Carlisle. These online webisodes fit in between the gaps in the television series and allowed the fans to immerse themselves in the Star Wars Universe like never before. This volume preserves those online stories for the ages. And thank God that this volume preserves those online stories not on the StarWars.com website! StarWars.com took them down…. The book also comes with two posters – one of the Jedi and clones and one of their antagonists, which is a nice treat to accompany the book. 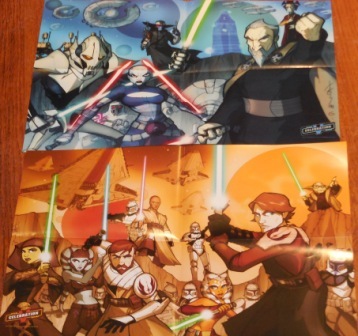 They seem to be promotional posters to accompany the book’s release at Star Wars Celebration V, but are, nevertheless, neat to have.